Derry's Sean Quinn takes on Kyle Coney of Tyrone. 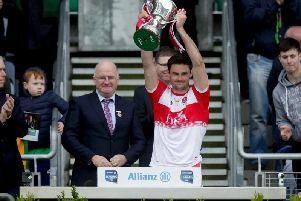 Derry manager Damian McErlain believes April’s focus on club games puts counties involved in the Ulster Championship preliminary round at a distinct disadvantage. 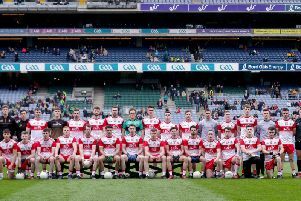 The Oak Leafers are scheduled to take on Tyrone on May 12th in Healy Park with most of McErlain’s panel facing four club fixtures before that in April and the Derry manager admits he is not a fan of the present schedule. “It doesn’t work. It is not practical,” explained the Derry manager. “The right men are not making these decisions. Set the county managers down together and ask them to manage it. Organise that and I’d say they might make a better fist of it because they would consider the clubs. “You are better just not having it because some counties play with starred games, so it doesn’t work. “It’s out of our control,” he added. “You just hope everyone comes through okay but the boys will enjoy it too. “The players need to go back to their clubs and play but our game being in the preliminary round does present a challenge. It’s not really fair on the two counties that are out so soon but the players will play the four games.